Snack time just got a tad bit more decadent with this cookie dough makeover. Bonus, it's gluten-free and vegan, too! Raise your hand if you like cookie dough? Yep, it's unanimous, all hands are up. Traditional cookie dough (you know, the stuff made with butter, loads of sugar, and cups of chocolate chips), is typically low in protein, has little to no fiber, and is packed with added sugar. Basically, a true indulgence when you want that decadent delight. But what if we remade that classic dough into a dip you could enjoy pre- or post-workout to fuel your body in a healthy way? Well, rest assured, that's what we've got for you today! 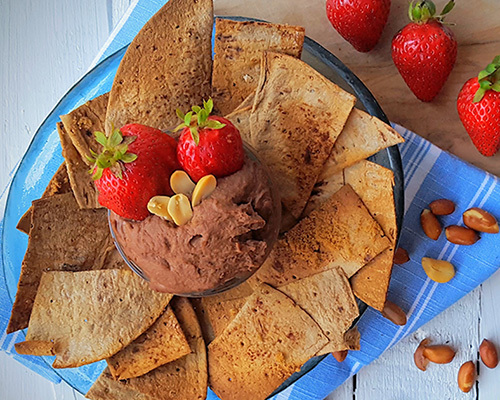 This gluten-free vegan chocolate peanut butter cookie dough dip (!!!) is soon to be your new best friend. It's loaded with plant-based protein from white beans and Jif Chocolate Peanut Powder, so you'll be feeling full and satiated enough to power through your next set. Plus, it's packed with fiber from the gluten-free Flatout wraps that pack 4 grams per serving. This dip will fill you up without filling you out. Try out the recipe from Elizabeth Shaw, M.S., R.D.N., C.L.T., of Shaw's Simple Swaps. Savor the flavor of pure bliss! In a food processor fitted with a metal blade, place white beans and pulse for 2 to 3 minutes. Pour Jif Chocolate Powdered Peanut Butter, brown sugar, kosher salt, and 1/3 cup of milk into food processor. Pulse another 3 to 5 minutes. If batter is very thick, add 1 to 2 tablespoons more milk. Scrape down sides and pulse remaining 1 minute. Taste test and then set inside refrigerator. Place cut gluten-free Flatout pieces on baking sheet sprayed with cooking spray. Lightly sprinkle sugar and cinnamon over the top. Bake for 4 to 6 minutes, rotate, and continue baking additional 5 minutes. Serve with chocolate peanut butter cookie dough dip. Enjoy!